We knew all along that we were having a boy, but even so, designing a room for a little boy I found difficult. I was never drawn to trucks and airplanes, dinosaurs or ducks and lambs. A true nursery theme wasnt my style and yet I didnt want a grown up bedroom. All of the things I knew I didnt want, and yet I found it hard to find inspiration for what I *did*. The turning point was buying a few key pieces that I loved, that brought the room together; First, it was the huge Giraffe that my Mom gave Oscar, followed by the Lion Art Print above the crib and the Sharon Montrose Photographs that solidified the animal consistency. The daybed is one of our favouite elements to the room. We turned a simple Ikea bedframe sideways and created headboard (DIY project here) making it a cozy reading area, and nighttime snooze spot for one of us. Above, The dresser we found beat up in a local store. Originally it was going to be a dresser with a lamp, but it quickly became a change table. Stanley the Giraffe looks over Oscar as he change him, and now Oscar knows Stanley by name and pets him on the nose after being changed. And above the changetable are our favourite pieces, the Sharon Montrose Photos that we framed in Ikea Frames. 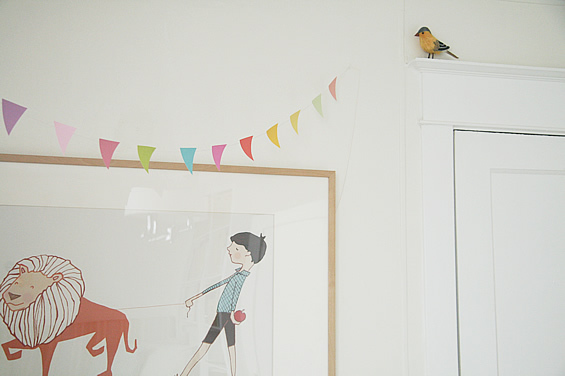 One of my favourite little elements is the birdy that looks over Oscar as he sleeps. When I was readmitted to the hospital after delivery, I was pretty upset and stressed at the hospital. With a new baby, nervous and not sure what was going on, Aubrey brought me this little bird at the Hospital gift shop. It instantly made me smile, and has a special place now in Oscars room. Sarahs work is enjoyed by Oscar as he lies in bed. And most importantly, Oscar loves his room. 😉 We have great fun in in, and hopefully it will be a place where he feels warm, safe, and loved, like throughout the rest of the house. I adore it! Great job!! It's such a calm and relaxing space, you did such a great job! I love how everything came together! SUCH a charming room – I love everything you did! The space is so serene – love it!! Everything is so well thought out and perfect, but I have to say that I really like the idea of a day bed – a place to sleep if baby needs you close at hand – in the nursery. You've done a wonderful job! Simply beautiful. I love how understated it is and it just looks perfect! What a lovely room for your little man! Well done. What a stunning room. I love Stanley. Oscar is very lucky to have such a great room. The composition of the bookcase is also really good. I love the room. You're so right-it is so difficult to design a room for a boy. Well done! By the way, where is the shelving unit from? It is not listed on your Sources. Wow – the before and afters are incredible. wish i would have seen this a couple of years ago when i was doing my sons' rooms. Great job. Love the daybed idea. what I wouldn't do to have a love seat in my son's room for the sleepless nights! Looking forward to reading more – just joined. It turned out SO great! The little seating area is adorable and the picture above his bed is just as sweet! Cute room for a cute baby boy! This room is so stunning, it takes my breath away. If I ever had another baby, this serene space would certainly inspire me. Love this so much! PS Posting this in a roundup, it's so fab. I absolutely love it!!! Such an adorable baby room!! I love the colors the "look" the layout and the whole "feel" of this room. Great Job!! That is a beautiful nursery! Such a change and such a difference! Oh my god this is GORGEOUS! Congrats! WHat a perfect room. Absolutely love it! I adore the print above the crib with the lion- so precious! The colour palate is so calm and the elements in the room so whimsical- all together, it is totally sweet and such a happy looking room to be in. Oscar is a lucky boy! You did a terrific job. It's lovely. I love the giraffe! My only caution would be the framed pictures over the crib. I don't know how you hung them, but at some point Oscar might try to pull them down and get hurt. Kids do that. i love what you have done! i was the same, didn't have a theme and wow..you are so creative! myt son is 9 months next week. i also had to go back into the hospital one day after we got home. very scary and sad. love your ideas!thanks for the inspiration! Oh my goodness. I just love this. So simple, sweet, chic, and timeless. No frills and gimmicks. How beautiful! One tidbit, as our little man got older and more wiggly, I started using the changing station on the floor and would slide it in and out from under the dresser. And now, we have a little lamp on the dresser for nighttime reading. Maybe you will get your lamp in there at some point too. It looks perfect! I especially love the art and the vintage changing table. What a transformation! I so love this nursery, white sorroundings is best for kids. love this room! i adore the giant giraffe! OMG this is incred!!!! Amazing job! absolutely perfect! you did an amazing job! Definitely ne of the nicest nurseries i've ever seen. I love all the details. I love Oscar's room! I was wondering what happened to the solar system mobile that you had bought? I really loved it. I'm doing a feature on fabulous nursery spaces and want to include Oscar's (with links to your amazing blog). Hope that is ok and hope you can check it out! It's amazing!! I love all the detail and the balance of them. You really have done so well! P.S. I have an 'Oscar' too! I'm on the hunt for an affordable glider. How much was yours? Anonymous – I'm so sorry, I just saw your note now.